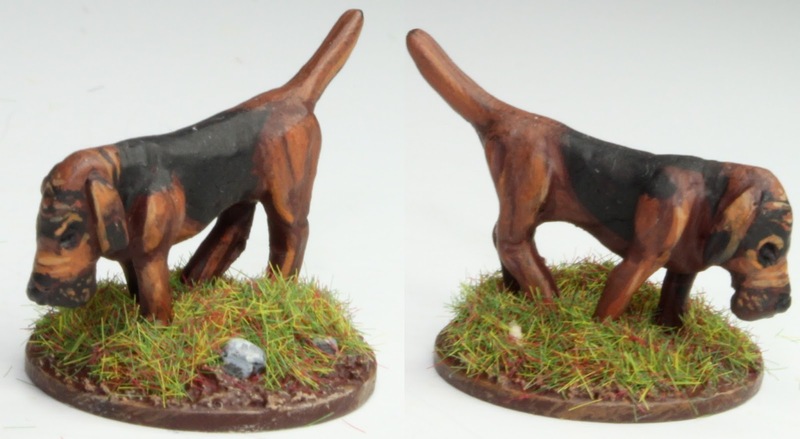 28mm Victorian Warfare: It’s a Dog’s Life! Nothing screams Puritan louder than a preacher quoting from the Good Book and this diminutive chap certainly has the pose down pat! We are not entirely sure who produces him, coming as he did from the fantastically generous haul of English Civil War miniatures donated by that fine fellow, the ‘Provost Marshal’. More a generous 25mm than a true 28mm miniature, this Preacher is a welcome addition to the forces of good and is painted in the typical black attire associated with the stout of heart at the time. In order to bring a little colour to the piece, I thought that he warranted the company of yet another member of the ‘Warbases’ menagerie, this time their Bloodhound. A splendid beast with a nose for sniffing out the denizens of the night, regardless of which form they might adopt. Finally a group shot of the assembled cast to date; (the pigs are just visible rooting under the trees on the right of the page.) next up the first additions to the forces of evil, if I every get around to finishing them. Excellent paintjob and a really nice setup for the last picture. Thank you Stefan, I now need to work on the other side now! Very skilled painting, especially the preacher's face really come to life. If the good book fails to persuade, I'm happy to see that he is also carrying a sword for further negotiations with the forces of Evil! Thank you and yes if all else fails he can introduce the Godless abominations to the pointy end of his sword! Thank you, I must now start the forces of evil. Difficult to make a figure wearing mainly monotone colours look interesting you you've definitely pulled it of. Plus a nice looking hound. That is incredibly generous of you Matt, thank you. Wonderful work Michael! The bloodhound looks amazing! Thank you Rodger, I was really pleased with how the hound came out. Excellent work and paint , as usual Michael . Great character, lots of style for those times.. and the added bloodbound is perfect for the time and setting! Great one! Thank you Mr. Lee, they just seemed to work well together. Thank you, just finishing off some of the evil forces to post at the end of the week. Thank you Nick, Foundry you think? Certainly fits style wise. Yes, it is OOP Foundry. I painted one up a couple of years ago. Just found your blog, by the way, and am enjoying it immensely. Hi Steve, thank you for the confirmation and glad you've found something of interest. Now that is a nice scene. Every thing really looks like it belongs. The dog and preacher are very nice additions. Thank you Clint, I now need some more trees and walls - will it ever end? Hmm... That hat band strikes me of smelling of VANITY! If not POPERY! Reminds me of a guy I was at university with who was a member of the Plymouth Brethren. You're right, it is a tad flamboyant! I'm thinking white for clarity in the gathering gloom when the monsters come! Top work Michael they look great. Thank you so much Mr. Smillie. Love the Bloodhound, he got a name? They all look rather splendid in the final shot. Thank you Bob, do you know I hadn't thought of a name, perhaps something from the Old Testament? Great looking additions, Michael. Really amazing work on the glasses too. Thank you Dean, but the glasses are not entirely by design!. Hmmm, I do like the bloodhound. He reminds me of Roscoe P Coltrane's dog "Flash"
I was thinking of getting a pair of them for my gangster gaming as I've recently read a Runyon tale featuring some. Flash used to always steal the show as far as I was concerned, a handsome beast! Great idea for the gangsters, I can just imagine some poor beat officer been dragged through the city on the scent of some ne'er-do-well! Excellent, love the last picture, great staging...a beautiful work on the glasses too! Thank you Phil, it was great to put them together to get a feel for what it might look like if I every get the game going! Great additions and a wondeful set-piece to finish off. It was a little well known fact that 17th Century preachers tended to be diminutive. You say the kindest things! I have to confess that the odd discrepancy in scale doesn't really worry me, but that said I've got some Warlord Games ECW on the bench at the moment and they're just tiny in comparison to Redoubt! Love the final scene. It's like something from a Hammer historical film! Thank you and you are spot on with the Hammer historical theme, which I'm pretty sure was hugely influential to the creators of Witchfinder General rules. Excellent job on them both! The final pic is superb it sets the scene well. Thank you Simon, it has been a lot of fun putting them together, but now need to find some time to sit down and get to grips with the rules. Excellent exhibition of a pastoral scene. Even the hound wails when the preacher exclaims, "Amen!?" They are a back woods pulpit team. I fear that there may be something else lurking in the back woods. Thank you so much Andrew of course I still cite you as the inspiration. Thank you Mark and that would have made another great title! Great idea Terry, I've got some witches on the table at the moment! Great jowls (on the hound I mean). Lovely work Michael! Thank you so much Curt, much appreciated. You are too kind Francis, thank you. Very nice work ans great scenery shot! He's a beaut sir even if he'll probably try and cancel Christmas! Thank you and I'm not sure he'll get away with cancelling Christmas as I've seen the angry villagers that are coming his way! Thank you, although I'm blaming you for not been able to now shift this blasted show tunes that are going around my head. What a wonderful character what he may lack in stature he certainly makes up for in personality. Fantastic set piece and the end there. Is it me or do those pike men look a trifle bored with the sermon. I think they are just fed up waiting for to paint something they can fight! Sterling work as always, Michael. Love the final picture. Thank you Sir, the ghouls next thanks to your paint guide. The senic picture are greate ! Lovely wor Mr. Awdry! I especially like the bloodhound. Thank you, he is a lovely addition, I must get Mrs. Awdry to name him!